Almost everyone experiences low back pain at some point in their lives. Low back pain is usually harmless. It tends to start suddenly and lasts a few days or weeks. The best thing you can do then is carry on going about your daily life and stay as physically active as possible. Resting too much or spending a lot of time in bed can make the back pain last longer. It is hardly ever possible to find a specific cause for back pain. But it's important to know that this "non-specific" low back pain isn't dangerous. The pain doesn't mean that there's something wrong with your back. This is also true if the pain lasts a long time or keeps returning. But chronic pain can become a big problem at work or in your daily life. Imaging techniques, medication, injections and surgery hardly help in the treatment of non-specific back pain. And they are associated with various risks. So experts agree that they should only be used very rarely. Low back pain (lumbago) affects the lumbar region of the spine. This is the lower part of the back, between your hips and the bottom of your ribcage. The pain is usually associated with muscle tension, and often limits your range of movement. The pain sometimes radiates (spreads) down to one or both legs. Low back pain that radiates down to below your knee or into a foot is called sciatica. This "specific" type of back pain is most commonly caused by a slipped disk. Although back pain and leg pain may occur together, they aren't always caused by the same thing. It is likely to be sciatica if the leg pain is worse than the back pain, if the pain spreads along a certain nerve path, or if it's accompanied by other symptoms such as tingling or numbness. Specific causes of low back pain include a narrowing of the spinal canal, an acute slipped disk, a broken bone in the spine (for instance, caused by osteoporosis) or ankylosing spondylitis. If a cause is identified, other types of treatments are sometimes considered. But low back pain is only rarely a sign of more serious damage or diseases. Low back pain usually goes away within a few days or weeks, even without treatment. It often returns: About a third of all people who have low back pain get it again within a year. it might be severe and last for quite a long time. It is hardly possible to predict how (acute or chronic) low back pain will develop over time in a specific person. At your first visit, your doctor or orthopedist will usually start by asking you a few questions. They may want to know whether this is the first time you have had low back pain or whether you have had it before, where exactly you feel the pain, and whether it is only painful when you move or when you are resting too. It is also important to let them know whether you have recently had an accident, whether you regularly take certain medications such as steroids, whether you have any other health issues, and whether you have other symptoms like numbness or paralysis. They will also ask you about any specific emotional or physical stress that may be contributing. As part of the physical examination, the doctor will do things like feel your muscles to see if there are any painful or tense areas, test your reflexes and check how well you can move. Your answers to the questions (anamnesis) and the physical examination are usually enough to rule out any major health problems. If that is the case, no further examinations such as x-rays, CT (computed tomography) or MRI (magnetic resonance imaging) scans are needed. Medical societies even advise doctors not to use such imaging techniques if there are no signs of a more serious underlying cause. These examinations can't really tell you much about what's causing non-specific low back pain. X-rays often "discover" visible bone or spine abnormalities that can also be seen in many people who don't have back pain. These abnormalities are usually caused by normal, harmless wear and tear of the bones. For example, some studies looked at CT scans of the spines of adults who didn't have back pain. It was found that about 30% of all 20-year-olds and more than 80% of all 80-year-olds have a protruding spinal disk. Too much testing can even do more harm than good. Imaging techniques might find an apparent cause of back pain that actually has nothing to do with the symptoms. This kind of "misdiagnosis" can lead to unnecessary or wrong treatments and anxiety. Examinations using x-ray, MRI or CT scans may be helpful if your doctor has good reason to believe that there may be a specific underlying cause or disease, or if the symptoms don't go away – or even get worse – within six weeks. The most effective way to prevent low back pain from returning is by regularly doing suitable exercises – for instance, a combination of exercises to strengthen and stabilize the core muscles. It's important to do them regularly (several times a week, if possible). Research has confirmed that muscle-strengthening exercises are effective: They helped to reduce the number of low back pain attacks by half. If you have severe acute back pain, you should avoid lifting heavy objects and take care when bending down. Getting into the following position can help to ease severe pain: While lying on your back, you put your lower legs on a raised platform high enough so that your knees are bent at a 90-degree angle. But it's important to avoid spending too much time lying down and to stay as active as possible. In other words, try to go about your normal daily life and, for instance, don't spend too much time sitting in one position at work. Gentle exercise such as going on a walk is a good idea too. Acute back pain nearly always goes away on its own. Research has shown that this happens faster if you stay active rather than getting bed rest. A simple way to relieve acute pain, which has also been proven to work in studies, is to use heat – for example, hot water bottles, heat packs or special cushions. Anti-inflammatory painkillers such as ibuprofen can sometimes help, too. But they should only be used over a short time period. People who have low back pain for a very long time – or keep getting it – have to take things into their own hands: With chronic pain, too, it's important to stay physically active and not let the pain stop you from doing things that you enjoy. A lot of studies have shown that movement is the best treatment for chronic low back pain. The longer you remain inactive, the longer your back pain is likely to last. Mindfulness and relaxation exercises, such as progressive muscle relaxation, have also been shown to help in some people. The most suitable types of physical exercises include those that strengthen the deep muscles of the abdomen (tummy), back and pelvis, in combination with stretching exercises. Pilates, tai chi and yoga often involve a lot of exercises like these. There are also a wide range of passive treatments on offer. These include acupuncture, massages, mobilization or manipulation of the spine, osteopathy, shoe inserts, ultrasound and laser treatments, as well as transcutaneous electrical nerve stimulation (TENS). Because low back pain gets better after a while without treatment, and often comes and goes anyway, the only way to find out whether a treatment really works is by doing comparative studies. Previous research of this kind has shown that most passive treatments aren't very effective, only help for a short time or haven't been studied enough. If someone has chronic back pain, approaches known as multimodal pain management or cognitive behavioral therapy may be considered. This involves learning strategies to help you cope better with pain – for instance, by recognizing and changing thought patterns that can make pain worse. What role does medication play in the treatment of non-specific back pain? 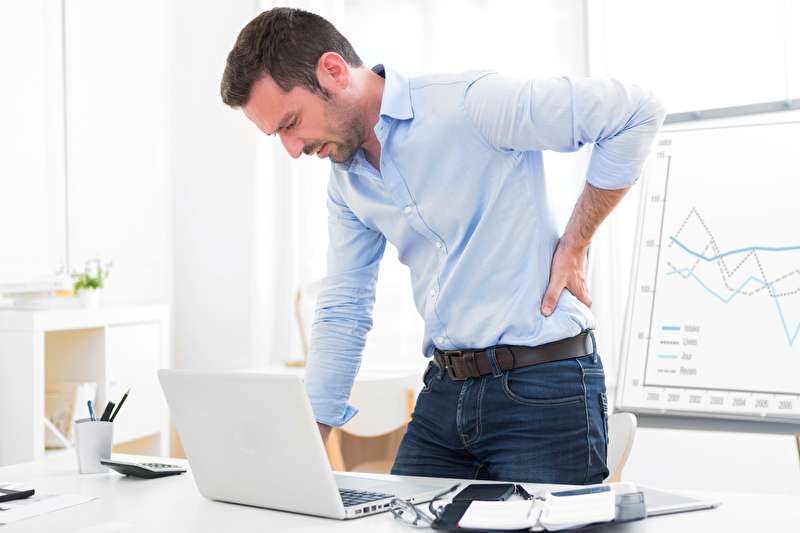 People who have frequently recurring or persistent low back pain may have to take long periods of time off work. They may then be able to take part in an outpatient or inpatient rehabilitation program. The aim of rehabilitation is to manage your symptoms well enough to be able to go about your normal daily life again. So it's not just a way to ensure that you can continue to work. Rehabilitation often consists of a multidisciplinary treatment program with a team of specialists from different fields working together. The team may include medical professionals such as doctors, physiotherapists and psychologists. The different program modules – for instance, treatment with medication, physiotherapy, exercise and behavioral therapy – should be tailored to the patient's needs as much as possible. Rehabilitation programs typically last three weeks. Chronic low back pain can take its toll physically and emotionally. A lot of people find it helpful to develop strategies for coping with the pain and the symptoms over time. Psychological treatments like cognitive behavioral therapy can help here. In Germany there are numerous sources of support for people who have chronic back pain, including self-help groups and information centers. There are many regional differences in how these services are organized, and they are not always easy to find. You can use our list to help you find and make use of local services. Bundesärztekammer (BÄK), Kassenärztliche Bundesvereinigung (KBV), Arbeitsgemeinschaft der Wissenschaftlichen Medizinischen Fachgesellschaften (AWMF). Nationale Versorgungsleitlinie Nicht-spezifischer Kreuzschmerz. AWMF-Registernr. : nvl-007. March 2017. Chou R, Deyo R, Friedly J, Skelly A, Hashimoto R, Weimer M et al. Noninvasive Treatments for Low Back Pain. February 2016. (AHRQ Comparative Effectiveness Reviews; Volume 169). National Institute for Health and Care Excellence (NICE). Low Back Pain and Sciatica in Over 16s: Assessment and Management. November 2016. (NICE Guidelines; Volume 59). Skelly AC, Chou R, Dettori JR, Turner JA, Friedly JL, Rundell SD et al. Noninvasive Nonpharmacological Treatment for Chronic Pain: A Systematic Review. June 2018. (AHRQ Comparative Effectiveness Reviews; Volume 209).